The cut grade is a diamond’s most important characteristic. The cut of a diamond is determined by its proportions and symmetry, it does refer to its shape. These feature affect how light interacts with the diamond, resulting in what we see as sparkle. An expertly cut diamond will have the ability to reflect and refract light to create the highest brilliance. The cut of a diamond essentially determines the sparkle. The cut grades vary from Ideal cut to Poor Cut. Excellent polish, Excellent Symmetry, "Tremendous" Sparkle An ideal cut stone reflects nearly all the light that passes through the diamond. Top 3% of diamond quality based on cut. Very Good Polish, Very Good Symmetry, "Lots of Sparkle" A Very good cut reflects nearly all the light entered in the diamond but not as much as an ideal cut for a lower cost. Top 15% of diamond quality. Good Polish, Good Symmetry, "A good amount of sparkle" Reflects most of the light that has entered the diamond. It optimized the size of a diamond without compromising quality or beauty. Top 25% of diamond quality. Fair Polish, Fair Symmetry, "Not much sparkle" Reflects minimal amount of light passing through. 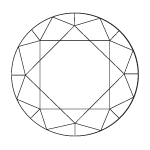 Color is determined by the amount of whiteness in a diamond or the lack of whiteness. It is considered the second most important characteristic after the cut of a diamond. It is rarer to have no color in a stone than to have tints of yellow, brown and gray. A color grade of D is the highest grade possible, while Z is the lowest on the scale. The size, location, relief, nature, and number of inclusions set the clarity grade of a stone. It refers to how clean or clear the inside of the diamond is. Flawless : No internal or external flaws. Internally Flawless : No inclusions. However, blemishes might be apparent. VVS1/2 : You are likely to find minute inclusions under 10x magnification but still very difficult to see under the microscope. VS1/2 : You will find minor inclusions under 10x magnification. SI1/2 : You will find noticeable inclusions that are very clear under 10x magnification. Sometimes, you might be able to see them without magnification. I1/I2/I3 : You will find obvious inclusions that can be visible under 10x magnification and/or even without magnification. At this point, the inclusions might be affecting the durability of the stone. A diamond's carat weight is a specific unit of measure that refers to the weight of a diamond. It is determined by how the weight is distributed and the make of the stone. Larger diamonds are more valuable than smaller ones because they are more found infrequently. "Under-sizes" are diamonds that weight right below the following cut-off sizes. The "cut off" sizes that cutters try to reach are .50ct, .75ct, .90ct, 1.00ct, 1.50ct, and 2.00ct. The cutters aim for under-sizes because they are very rare and represent great value in terms of price. Rollover on diamonds to learn more. The Marquise cut first appeared in Paris circa 1745 and its fascinating history can be traced back to the height of the French monarchy. King Louis XV commissioned his court jeweller to create a diamond that resembled the smile of his beautiful mistress, the Marchioness Madame de Pompadour.The shape was then developed and modified throughout the 20th century, evolving into the Marquise Brilliant cut as it is known today. The first pear-shaped diamond was created in the 1400s by Flemish cutter Lodewyk van Berquem of Bruges, inventor of the scaife. Van Berquem also established the now commonplace symmetrical arrangement of facets on a stone, this in turn led him to develop the pear-shaped "Pendeloque" or "Briolette" cut. A typical pear shape brilliant cut should consist of 58 facets. Although oval shaped diamonds were found over 200 years ago, the modern oval cut was invented in the early 1960s by leading Russian cutter Lazare Kaplan. The cut eventually earned him a place in the Jewellers International Hall of Fame. The origins of the round brilliant cut can be traced back to the middle of the 17th century when diamond cutters began using more refined and complex ways of cutting diamonds. It was not until 1919 that the early modern round brilliant was created; at the time it was referred to as the Tolkowsky cut named after its creator, Russian mathematician and diamond enthusiast Marcel Tolkowsky. The exact origins of the first emerald cut remain somewhat ambiguous, although its stylistic specifications can be traced back to the single table cuts of some 500 years ago and the multi-faceted table cuts of the Art Deco period in the early 20th century.The term “emerald cut” only began being used during the Art Deco period, despite the fact that diamond cutters were already cutting the same shape under different names. The princess cut stems from the first square shape diamond called the “barion cut” and the “profile cut”. The beauty of a square shape diamond lies in that it is the most scintillating cut of all diamonds. Israel Itzkowitz from Ambar Diamonds created the modern princess cut in 1979. His vision was to get the same fire one would from a round cut diamond but with a square shape. The exact origins of the heart shape are unknown although being a modified brilliant cut it may have appeared as early as the 16th century. The first recorded heart shape diamond appears in a portrait entitled “The Gonzaga Princess,” painted circa 1605 by Frans Pourbus the younger.